Fortunately, I was able to find a video, an interactive activity, AND practice problems, all of which focus on telling time, and which hopefully help me do a better job at keeping track of time so this never happens again. And I found all of these great resources nicely organized at this month's Fantastic & Free First Fridays Resource of the Month: ck12. CK12 began their journey in 2007 and in 2008 began releasing "Flexbooks"—free, interactive textbooks—in Science and Mathematics. 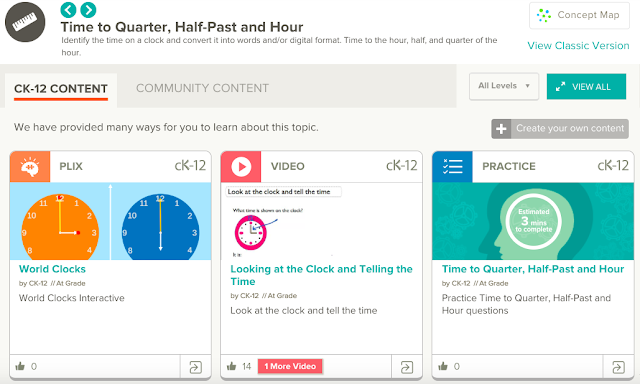 Today, cK12 is loaded with content at all grade levels that is incredibly well-organized around topics, allowing teachers and students to easily search and review content related to whatever topic it is they wish to teach or learn. By having Creative Commons licensing, cK12 has amassed a community of users who have created or modified existing or new content and shared it on the platform. As you browse content on ck12, it is organized into "cK12 Content" and "Community Content," giving users the opportunity to browse both content that has been created and vetted by cK12 as well as additional content that has been created by community members. 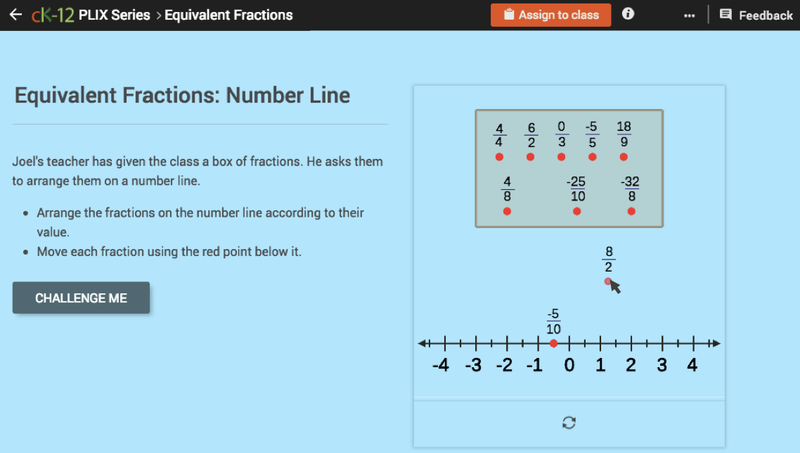 cK12 has a wide range of consistent content types for numerous topics in math, science, and more across multiple grade levels. Content is organized into two tabs—"ck12 Content" and "Community Content." As I've mentioned before, I believe one of the keys to making free content more readily available and usable to learners and instructors is to organize various learning resources—potentially from multiple sources—around topics. CK12 does this masterfully with super simple topical navigation. Users select a subject area, then drill down into a particular topic within that subject they are interested in teaching or studying. 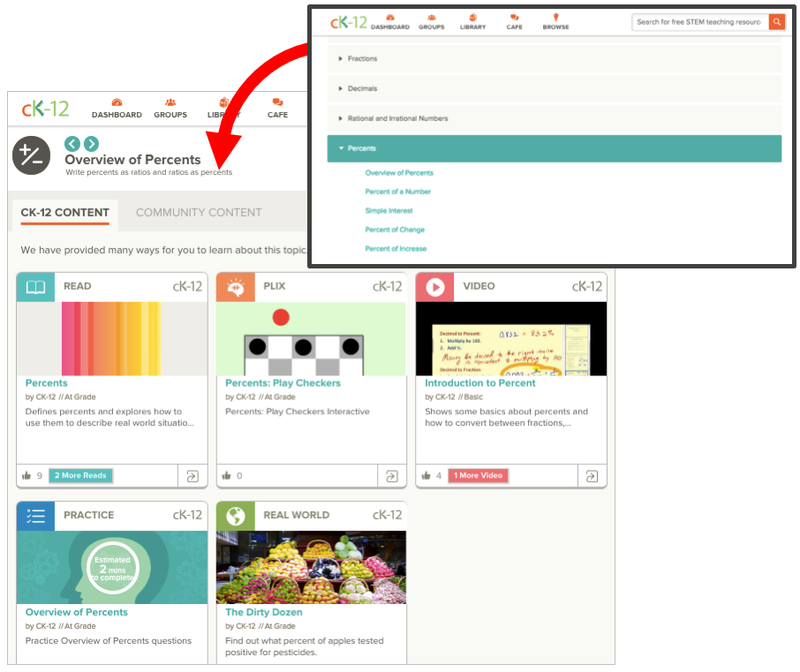 At the topic level, the user can see what available resources there are, including readings, interactivities, videos, practice worksheets, real-world activities, study aides, and even adaptive practice. Best of all, previewing content is immediate, meaning you don't have to click a bunch of times to actually see something, nor do you need to download anything in order to view it. ck12 features a very easy to navigate, topical directory of content. Once a topic is selected, students and instructors can see various resources aligned to that topic across multiple modalities, including readings, interactivities, videos, practice, and more. Readings and practice can be downloaded as PDFs or HTML files so they can be utilized offline as well. Many of the readings and practice activities on cK12 can be downloaded as PDF or HTML files and can also be viewed on cK12's Flexbooks mobile app. Within any content downloads, links to interactive features such as videos are retained, so learners can still access these even if they aren't working within the platform or via the Flexbooks app. And, as noted before, teachers also have the ability to create their own content, as well as cobble together content from various topics and modify and arrange as they wish to create their own Flexbooks. One of my favorite resources is the PLIX Series of interactives, one of the newest set of tools offered by cK12. These interactive activities—numbering over 1,100—are ideal both for whole-class instruction or for individual practice, and are included for a majority of the math and science topics within cK12's library. The PLIX Series of interactives offers learners the opportunity to interact with content. These simulations help learners “see” content in action by using manipulative tools to help them answer questions about the topic. Of all of the large-scale content platforms I have reviewed to this point, I truly believe cK12 has done the best job of making its content really easy to fit in with however a particular instructor wishes to teach. In addition to great content organization, clean navigation, and consistent content formats, cK12 also has integration with a number of platforms such as Google Classroom and Learning Management Systems including Canvas, giving instructors the ability to directly assign content from cK12's extensive library of educational resources to their classes within their content/assignment delivery platforms of choice. Much of the content also has HTML embed codes available, meaning instructors have the ability to embed the content directly onto any HTML page. 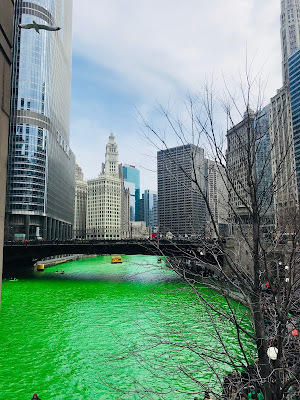 Embedded content automatically includes cK12's required attribution language, meaning the important step in the spirit of "openness" of giving credit to cK12 is seamless. As adult education instructors look to begin aligning their curriculum to new tests aligned to the College & Career Readiness Standards for Adult Education, I encourage you to take a look at cK12 for great resources to help supplement whatever additional materials you currently are using or are considering purchasing. With a wide range of content types across numerous topics and grade levels, I'm certain you will find something fantastic and free both you and your students will love. NOTE: Starting very soon, we are going to be reaching out for volunteers to assist in aligning content from resources such as cK12, Khan Academy, and others to the College & Career Readiness Standards for Adult Education. Interested in participating? Sign up here to let us know. We'll be in touch soon with more details, including a series of webinars over the coming months. 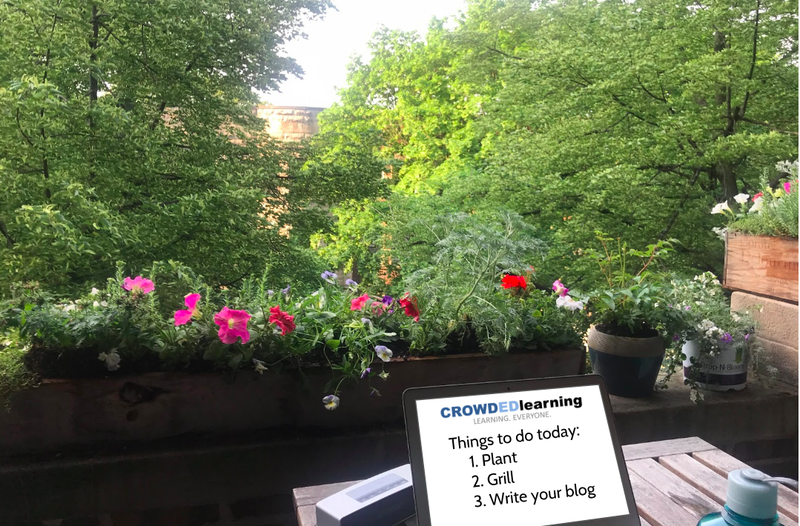 Please check out www.crowdedlearning.org. There, you can learn more about our goings on and sign up to volunteer your expertise, stay in touch, or make content recommendations. We look forward to hearing from you! Do you know of a particularly great resource you'd like to share? Please let us know about it! Want to explore great, free content? Take a look at our Skill Directory.